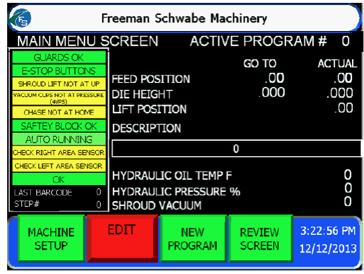 Freeman Schwabe has a broad range of proprietary software to complement each machine for an even better performance, efficiency to meet you manufacturing / converting application needs. All Freeman Schwabe die cutters come with a useful tool known as the Die Life Monitor. Our die life monitoring system will help predict a die`s need to be sharpened or replaced, helping to better schedule production requirements in today`s most demanding industries. Die cutting tools will dull as time progresses and manufacturing continues. Most dies can be sharpened and reused multiple times before needing to simply be replaced. Many facilities will send their dies to the die manufacturer to have them re-sharpened. Depending upon the die manufacturer`s capabilities, the lead time to have that die back in production can vary. 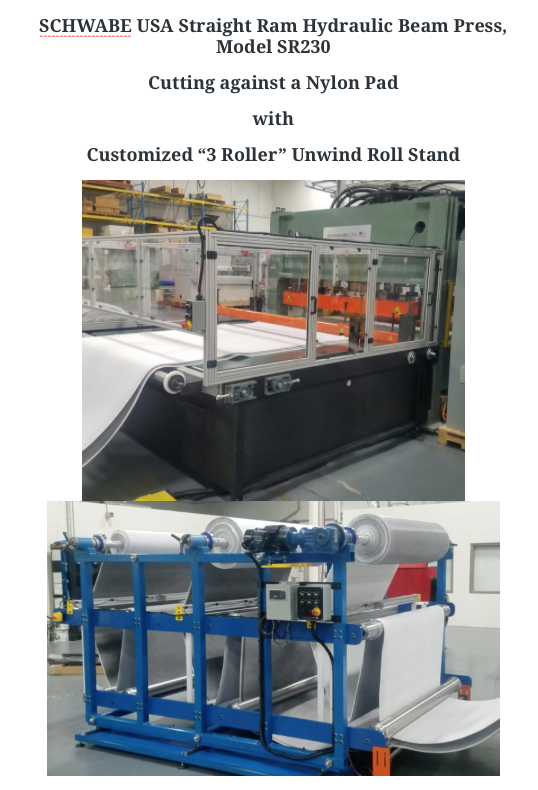 We recommend having a second die for the same product in queue for this reason and utilizing the benefits of a Die Life Monitor system to keep production moving. Expect less downtime when your production team has the ability to alternate dies and work around the inevitable need to rework the necessary tooling that keeps your manufacturing process flowing. Our software capabilities allow the customer to store a large capacity of programs dependent upon the dies needed for the job or the materials used for that particular job run. Within each program number, there is a Die Life Monitor for that particular die program that is written and stored. A counter will continue to increment, once for each cycle of that chosen program, when selected from the operator`s touch screen. The Die Life Monitor`s counter is password protected and recommended to be reset only by personnel that are familiar with this feature. Each time a die is replaced or reworked, simply reset the Die Life Monitor`s counter. Periodically check the Die Life Monitor`s counter to stay one step ahead in knowing when your cutting dies need attention. When using cutting belt as the cutting surface for your manufacturing operation we recommend a Belt Life Monitor. Belt Life Monitor can help our customer`s production team predict future downtime regarding a necessary cutting belt change. A cutting belt is a wearable item that does need replaced periodically. When a cutting belt needs replaced, most of our supplied equipment requires the use of an outside contractor with the necessary equipment and expertise to fashion a seamless joint of a cutting belt during its installation. This ultimately leads to production downtime during the cutting belt replacement and proper belt tracking procedures recommended by our suppliers and in house service team. 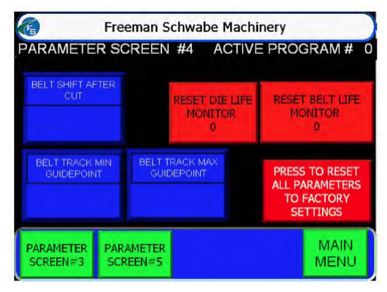 When a new machine is purchased from Freeman Schwabe Machinery, the Belt Life Monitor will reflect any test cutting done by qualified Freeman Schwabe representatives prior to the required factory acceptance tests. Once our customer receives the purchased equipment, our qualified installation experts will install and train the necessary customer employees on that equipment. With proper die settings and programming training provided, the belt life will vary according to our customer`s products and choice of die rule being used for each particular product. When the first belt change is required, the customer will be able to access the Belt Life Monitor counter in the operator`s touch screen. An additional feature that can be added to a Freeman Schwabe machine is the hydraulic pressure digital readout on the touch screen. This is helpful in identifying die issues such as a dull die, the wrong material being produced for that program, or a worn cutting surface. Operators can then see the actual cutting pressure`s percentage while running a particular program. The maximum pressure for that particular die or program can be stored within the written program itself. When the programmed percentage exceeds the maximum allowable pressure, an error will be displayed on the screen alerting the operator that this has happened. The displayed pressure can also be added to be used as a reference only, depending on the customer`s needs. Many customers also like to keep track of their hydraulic fluid temperature. This is essential when operating hydraulic die cutting equipment in warmer or heated environments. As the temperature of the oil exceeds the manufacturer`s recommendations or the hydraulic valve manufacturer`s recommendations, viscosity will be affected. This can cause pressure drops within the hydraulic system which can also affect the cutting pressure. The seals and o-rings within the hydraulic cylinders and valves can prematurely start to disintegrate due to overheating. Carbon deposits from the heated oil will also start to build up within these components and inside the hydraulic tank over long periods of time when running the equipment in extreme environments. This leads to downtime due to repairs of the hydraulic system. Stay ahead of the game and allow your business to grow by utilizing the innovative technology offered at Freeman Schwabe Machinery. Your material converting specialists. Contact us at sales@FreemanSchwabe.com or call +1 513-947-2888 to ask about our featured products mentioned above.